Features 1” one piece tube design Precision ground, fully multi-coated lenses with wide band coating Duplex reticle Fast focus ocular Posi-clik brass finger dial windage/elevation 4” eye relief 100 yd. parallax Nitrogen filled Waterproo.. 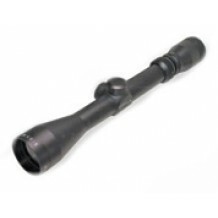 Features 1” one piece tube design Precision ground, fully multi-coated lenses with wide band coating Duplex reticle Fast focus ocular Posi-clik brass finger dial windage/elevation 4” eye relief 50 yd. parallax Nitrogen filled Waterproof..